From Playbill.com, "The passengers on this luxury cruise include an evangelist turned nightclub singer, a gangster disguised as a minister, hopeless romantics and stowaways. The sparkling Cole Porter songs include 'I Get a Kick' 'You're the Top,' 'Friendship' and "Easy to Love." Bon voyage!" Anything goes is a show that would be enjoyed by the whole family! It exemplifies the qualities of a classical Broadway Musical! www.Broadway.com says, "With the exception of some slight sexual innuendo and a few jokes that might be considered un-PC by today’s standards, Anything Goes is fast-paced, farcical and kid-friendly." 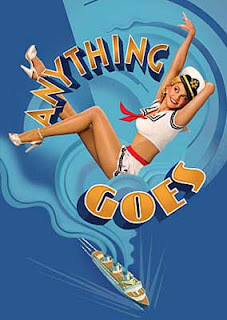 Anything Goes is performed at the Stephen Sondheim Theatre in New York, NY. Tickets can be purchased at the box office, online at Telecharge.com, by phone at 800-432-7250, or if your buying tickets for a group call 800-432-7780. Tickets range in price from $87-$137. Unfortunately they are not accepting promo codes for this production but, if you visit http://hiptix.com/ there are a very limited number of discounted $21.50 tickets available. You must register with the Roundabout Hiptix Program and must be between the ages of 18 and 35, then you can purchase 1 pair of tickets per production at this discounted price. General Rush: There are also a limited number of $30 tickets available when the box office opens the night of the show. These are limited to only 2 tickets per person. The Cast recording for this 2011 revival is not yet available.